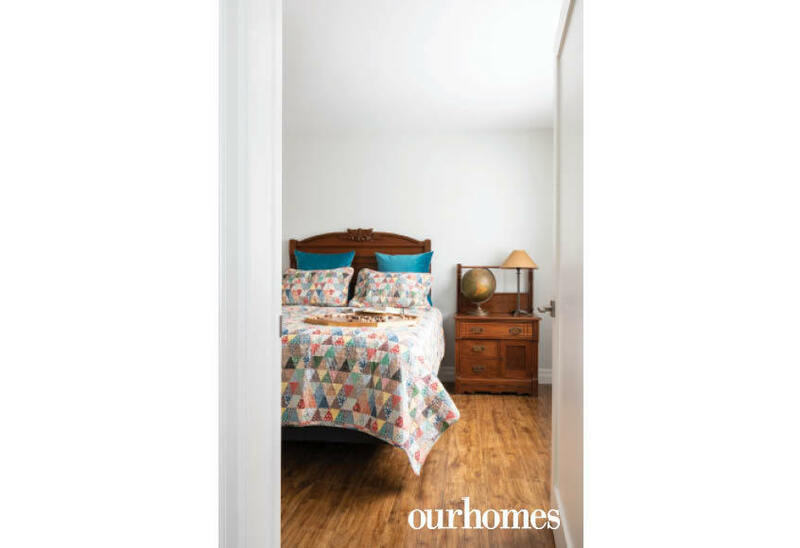 This new Thornbury home has deep roots. 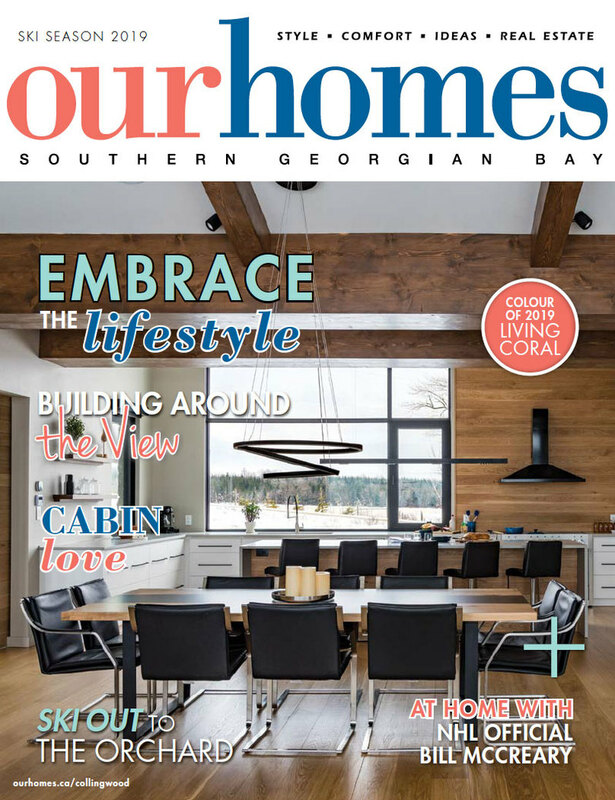 A version of this article originally appeared in the Ski Season 2019 issue of OUR HOMES Southern Georgian Bay, p.140. Find local businesses in our Southern Georgian Bay directory. 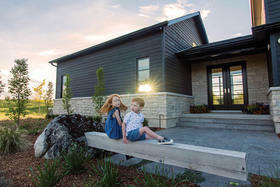 For decades, Brian and Susan Marshall spent nearly every winter weekend and much of each summer at their Thornbury-area property. 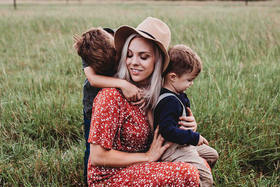 But, faced with a multitude of repairs to the home and craving a layout that better suited their needs, they looked to purchase a differnt property. But seeing the available options on the market, they realized how much the loved their existing location with its wide, sweeping views of the bay and surrounding countryside, along with its proximity to skiing, sailing and amenities. It was merely the structure they needed to change. 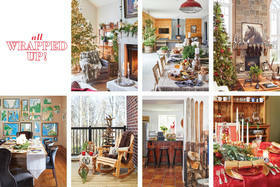 The Marshall family’s completed vacation home is bright, open and welcoming – showcasing their never-ending views and providing charming spaces for the family to relax and play. 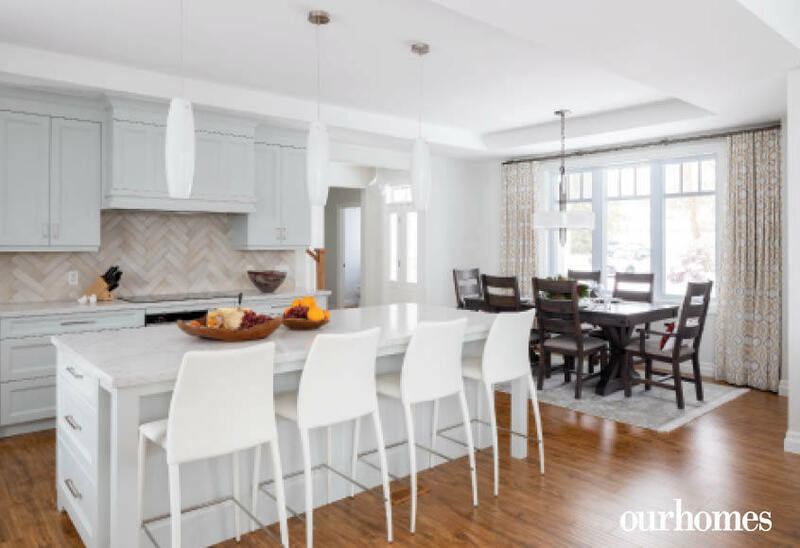 Corinthian Kitchen & Bath Studio designed the open-concept, dine-in kitchen, with its flat-panel, transitional-style cabinets (painted in Benjamin Moore’s Wickham Gray) and Caesarstone quartz countertop. The large, centrally located island ensures ample space for meal preparation as well as ease of conversation with those in the dining and living rooms. 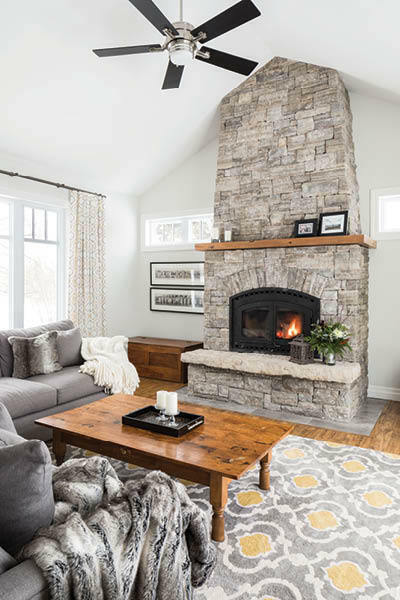 A focal point in the open space is the large dry-stack stone fireplace, designed and installed by Steve’s Masonry to surround the original wood-burning insert, installed by Chantico Fireplace Gallery. Adjacent to the main living space, with hardwood installed by The Flooring Place Inc., is a large, sunny deck, providing the perfect location for sunset dinners overlooking the swimming pool and bay. Just off the deck is the main-floor master bedroom, with its large, wall-spanning windows and patio door. 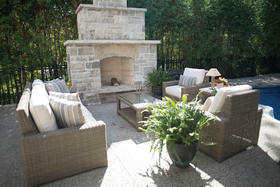 Upstairs, three bedrooms and an additional washroom are well-appointed for visiting family and friends. Bedding in both bedrooms was sourced at Clerkson’s Home Store. 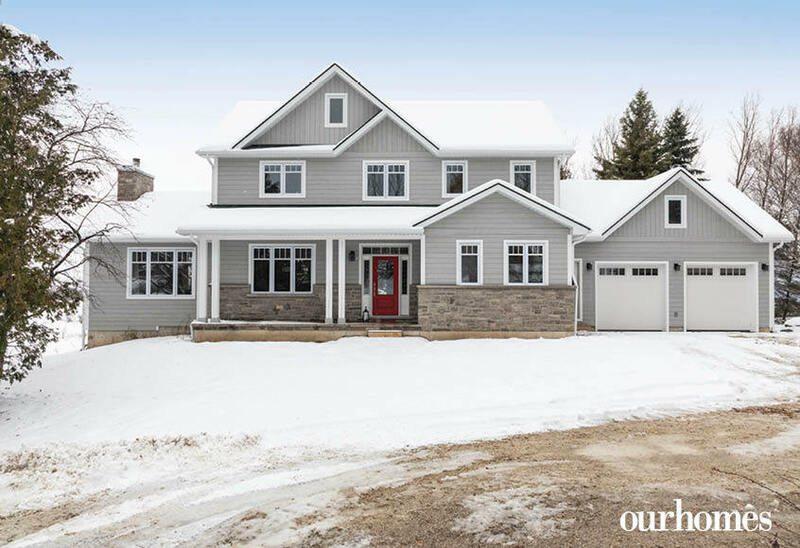 The stone apron and wood siding add a historical charm to this new home in the Thornbury area. The abundance of windows guarantees a light-filled interior. 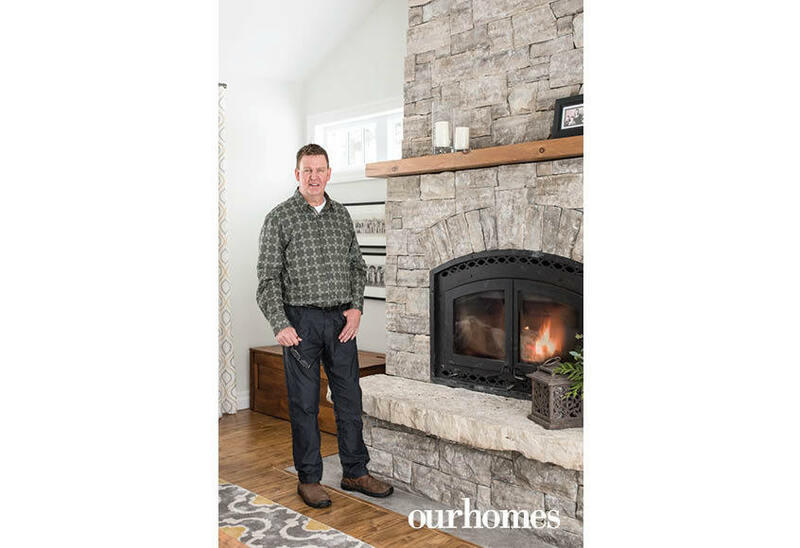 Builder Harold Robison of Bob Armstrong Construction stands by the dry-stacked fireplace. 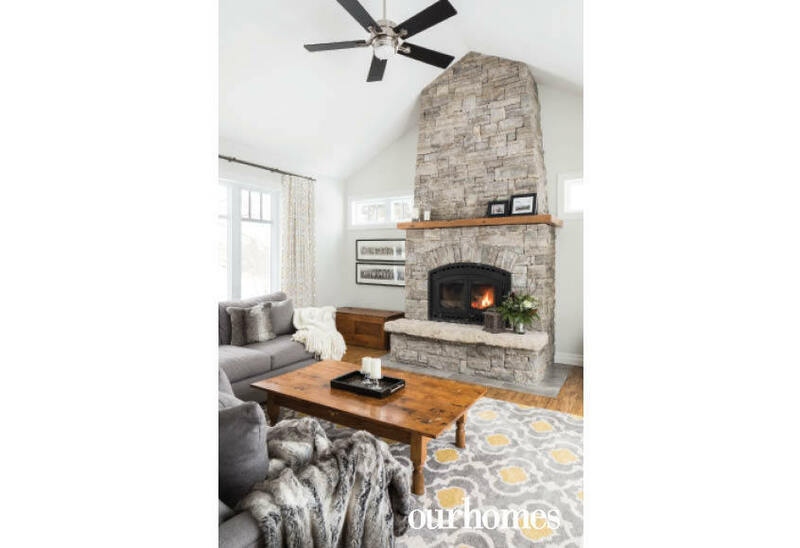 The beauty of the dry-stacked stone fireplace can be seen and enjoyed throughout the large, open-plan living room. The living area in the open-concept home is where the family spends the most time. 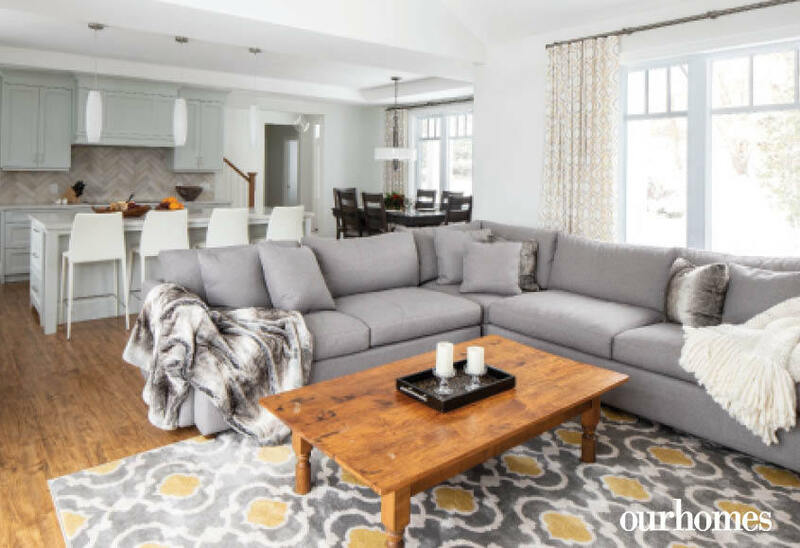 The soft grey in the sectional sofa is picked up in the curtains and the carpet, and subtle gold tones appear throughout to unify the room. 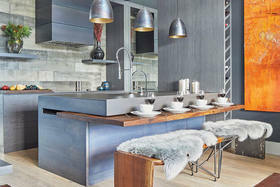 Corinthian Kitchen & Bath Studio designed the large, functional kitchen. There are enough stools for the whole family to grab breakfast before heading to the slopes. 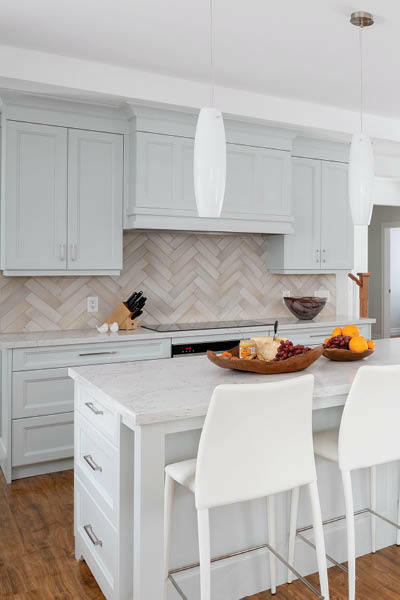 The cabinets reach to the ceiling and a subtle herringbone backsplash offers texture. 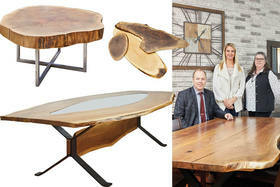 In the open-concept main living space, a carpet under the dining table defines this area and adds formality. Drapery with a subtle pattern and colour ties into the rest of the home. 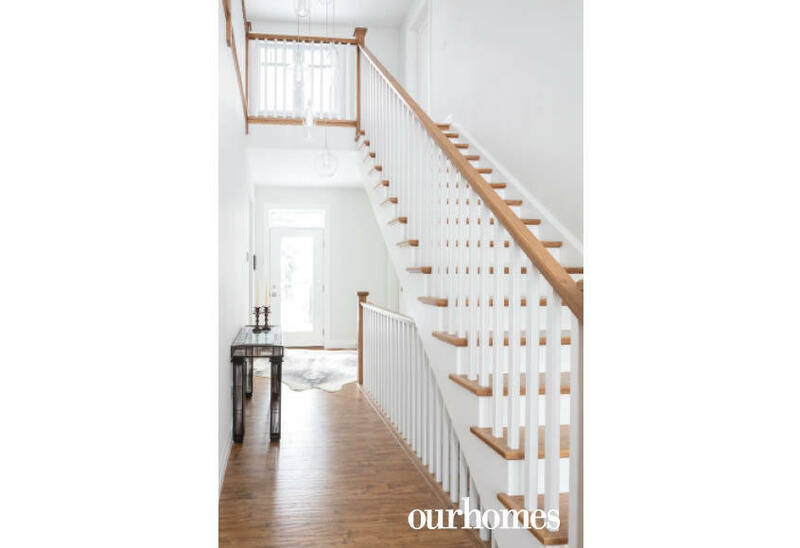 Crisp white pickets and warm wood railings and stair treads add to the home’s bright, clean feeling. The colour grey is used again in the master bedroom to create a calm serene space. Faux fur throw and pillows add a bit of texture. There is a view over the pool and to the fields beyond plus an entrance to the upper deck. 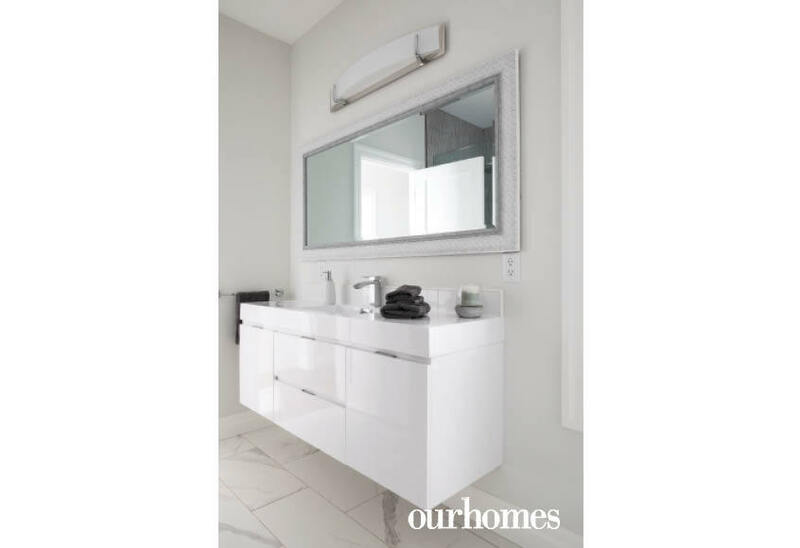 The floating vanity in the master bath has lots of storage. The linear mirror and light above draw the eye along to expand the space and offer a glimpse into the large shower. 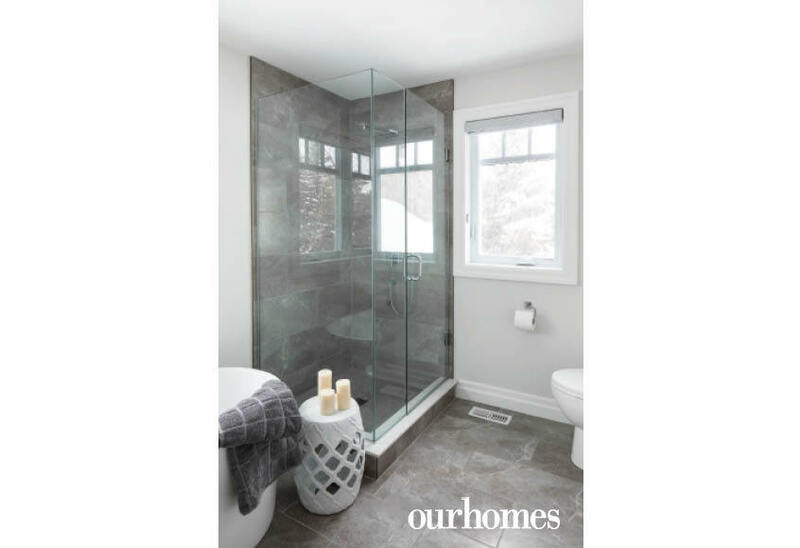 Located beside the en suite is a walk-in closet. With its patchwork quilt and turquoise Euro pillows, the antique bed is a welcome spot for a good night’s sleep, or a game of crokinole. In one boy’s bedroom, a large closet stows all his ski gear. 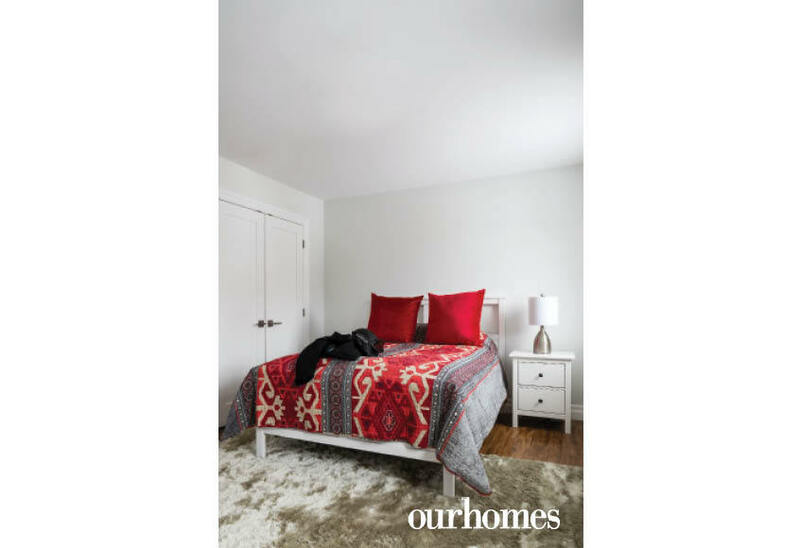 The Navajo-inspired quilt injects some colour into this neutral room. The second floor bathroom has everything for a spa experience. The tile used on the floor extends into the glass-enclosed shower. There is also a window over the vessel tub.